In the past week or so a few big fiascos of the past NFL season have been finalized. 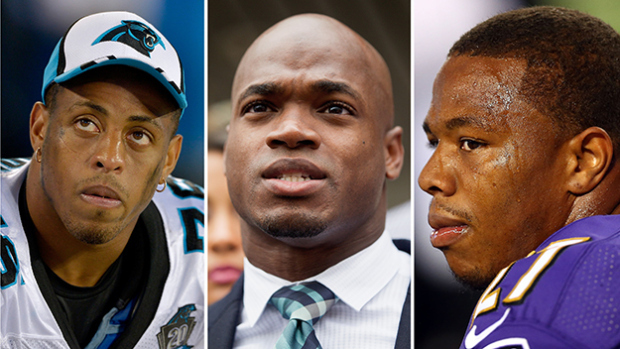 Ray Rice has gotten his pay-out for a season of doing nothing, Greg Hardy has gotten off on domestic violence charges, and Adrian Peterson has one his grievance with the NFL. What does this say about things? Well, I think we all know that there’s still work to be done on these topics and the extenuating circumstances that follow them as a result. But it almost seems as if there is a payoff for all of these guys. Their claim is that they need to make a living, but shouldn’t they have thought about that twice before doing what they did? Ray Rice is the only of the three that won’t ever find a job in the NFL again. He’s got a million-dollar offer to be a fantasy football analyst for a big online firm. So that’s a solid option for a guy that “had thoughts of committing suicide”. Let’s be real here, anyone that has ever had any kind of depression has had brief thoughts of suicide, but the difference between those that REALLY need the help and the ones that don’t is whether they go through with any kind of attempt. I don’t feel bad for Rice. The guy just got 1.5 million from the Baltimore Ravens for doing absolutely nothing. To be fair, he probably would’ve done the same on the field this year, but at least he would’ve earned it. Now Rice gets to do nothing for the rest of his life and it will pay. Eventually becoming some sort of analyst, reality TV, and writing his own book are just a few of the options open to the former dynamo. Maybe we had to get through these kinds of issues to have the way contracts are written changed. It still doesn’t make it any easier to deal with Rice getting away with so much money. And I get it. He’s not yet 30 and he’s probably black-balled in a lot of circles. But the guy was still an elite talent in the NFL and getting degrees aren’t so difficult that some sort of corporate job couldn’t come along. So Adrian Peterson is in talks to get his job back already. And now that Greg Hardy has gotten off on abuse charges, he’s free to sign with anyone he wants. Former teams (save the Vikings because Peterson’s football talent is more important than sticking by your morals) will look to avoid dealing with players that have certain history going back to college (especially for potential draft picks). This might screw over a lot of guys. In fact, Brandon Marshall may eventually get pushed out of Chicago due to past allegations of domestic abuse. Dez Bryant is being probed for a past issue with his mother (though his mother is backing her son now even though she was the original complainant to the cops). These are real-life issues that have taken a long time to matter to people for some reason. Let’s not let them become an afterthought so quickly. People in this country are so quick to lose interest in things that aren’t popular and/or don’t affect them directly. Even when domestic violence is close to us it’s tough to make a lasting effect in a real way (i.e. funding for non-profits, new laws, etc.). It’s time that people face some real consequences. All the people that have DUIs aren’t given lost wages for current or future jobs that they won’t get, but yet somehow they deal with it. I don’t see how it’s that much of a difference.